It's sad when series end - I came to this one relatively late, just in time for the last anthology to be published. 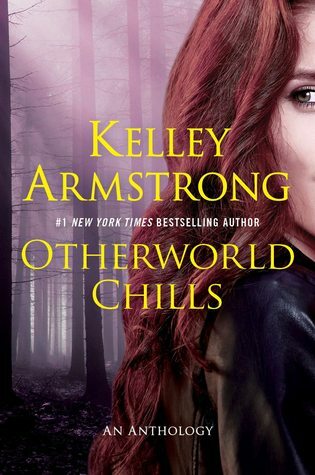 Kelley Armstrong is awesome in that she gives us lots (and I mean, LOTS) of short stories as extras for this series. There's a few stories set between most books, in which there were 13. A lot of them were available on her website for free, and a few still are, but most have been collected into anthologies such as this one. It seems I don't always have the same taste as authors when it comes to the short stuff, because it seems they put my least favorite offerings in the beginning and save the good stuff for the end. Here it's kind of like that, putting in a long story with Nick alternating his POV with a new woman in his life, and then my least favorite couple first meeting, Karl and Hope. After that it's much smoother sailing, or should I say pure glee and wild party fun? Chaotic was cute but with Hope and Karl first meeting and then doing a job together. It's long and a delight IF you're a fan of the couple, which I'm not. Amityville Horrible is the best thing about this book, at least for me. Jaime is one of my favorite heroines and the story shows her giving it one more go with a certain televised production. The set isn't actually at the Amityville house but a duplication of it. Jeremy tags along. Not only do I love their relationship, I love when they solve mysteries together. With the ghosts, weird sets, fake guests being behind the scenes, it feels like a mini Scooby-Doo gig. It's fun and charming and delightful. Sorry Seems to Be the Hardest Word is a surprisingly refreshing story with Cassandra and Zoe. I never felt much of a bond with Cassandra but this story shows her a wee bit closer to the end of her lifespan and wanting to clear the air on a certain something. It wasn't a major something, but sometimes the small things make a world of difference. The ideal length for what the story contained. Off-Duty Angel shows Eve and Kristoff again battling the forces of evil for the benefit of good...okay, Eve is just bored so Kristoff creatively comes up with something for her to do. She's more likable in the story than some of her other stories since she comes across more rounded. It's not a story that fills in back details or advances the main plot, it's just a side adventure that kicks forward some fun. The Puppy Plan shows the sweet twins of Logan and Kate at 9 - geez - so a big step ahead in the future. It's told just through Logan's point of view. We get bonding parental time with Clay, a heart to heart with Jeremy (who STILL isn't' with Jaime full time), some mom concern from the now alpha Elena, and a sweet sister thing. Let's say these kids turned out sweet and sensitive. A cute puppy and Christmas is involved. Aw. Baby Boom brings in Paige's last story through her POV. Benicio is still playing the puppeteer but this time not the evil one as they keep investigating. We see a birth for Savannah and maybe other characters as they've moved on. And finally-finally-finally we learn what will happen to the future Cabal and if Lucas will finally lead. It's a great story and my second favorite beside Amityville Horrible. I will miss these characters. The only thing soothing me right now is knowing they received happy ever afters, and that I have a few other anthologies I haven't read yet.